Irish Energy Blog: How many homes can a wind farm power ? How many homes can a wind farm power ? SSE Airtricity says that when built the wind farm will deliver enough green energy to power 84,000 homes, which is equivalent to almost 90% of the homes in County Galway. A new wind farm to be built in Galway will be the largest in Ireland at 169MW. One might wonder where the figures for the number of homes to be powered by a wind farm or indeed any generating plant comes from. And is there a more accurate method of calculating this figure for a new wind farm ?- as we shall see, the correct answer depends on the amount of wind farms already installed in the system. So it is envisaged that the output of the windfarm will on average be 28.5% of it's ideal output i.e. if the wind was blowing at the right speed for 100% of the time. So there will be times that the output will be above 28.5% and times it will be below. Hence, the key word is on average. Average power is not as useful as reliable or dispatchable power. That is why a system powered completely by wind energy is impossible. So the 84,000 homes will not be powered directly by the wind farm, but rather as part of a system that includes power from more reliable sources such as gas, peat, coal etc. It is only equivalent power that the wind farm generates. On their own, a wind farm cannot power a house at all. The inherently variable nature of wind power makes it necessary to analyse its adequacy impact differently from that of other generation units. The contribution of wind generation to generation adequacy is referred to as the capacity credit of wind. This capacity credit has been determined by subtracting a forecast of wind's half hourly generated output from the customer electricity demand curve. The use of this lower demand curve results in an improved adequacy position. The amount of conventional plant which leaves the system with the same improvement in adequacy as the net load curve is taken to be the capacity credit of wind [Eirgrid 2009]. Analysis of wind data has established that this capacity credit is roughly equivalent to itscapacity factor at low levels of wind penetration. However, the benefit tends towards saturation as wind penetration levels increase. This is because there is a significant risk of there being very low or very high wind speeds simultaneously across the country. This will result in all wind farms producing practically no output for a number of hours (note that turbines switch off during very high winds for safety reasons). In contrast, the forced outage probabilities for all thermal and hydro units are assumed to be independent of each other. Therefore, the probability of these units failing simultaneously is negligible [Eirgrid 2009]. So we can see that this gives us a more accurate measure of the contribution of wind towards powering homes. We are currently at about 2,300 MW of wind so adding the new Galway wind farm will bring us to about 2,500MW. The capacity credit for new wind farms reduces as we install more wind farms so wind farms installed back in 2008 and 2009 contributed more to the overall system than ones installed today in 2015. This is because, to put it quite simply, the risk of blackouts increases (as does wind curtailment). Conventional gas generators will be placed on high alert for the next few years as we install more and more wind. So our new 169MW wind farm will contribute only about 30-40MW to the overall electricity system in conventional generator terms. This equates to about 17,000 homes or 20% of the number of homes stated above. Are we really getting bang for our buck, considering the environmental impact (about 70,000 tonnes of concrete will be required in its installation) and cost to the consumer of this wind farm ? Your graph on capacity credit graph assumes constant rates of output per wind turbine an annual basis. Wind turbines can loose up to 50% of their capacity every 6 years. As wind access to the grid is limited to 50% of total demand after 1000 megawatts of capacity, 50% of night time demand, were installed. The increased output from capacity added after that started to tend towards zero. As we are now at 50% peak demand usable internally output per megawatt added has to be very close to zero. So the number of houses supplied by that Galway wind farm could very well be ZERO. As Eddie O'Connor now says that 25% of total internal demand is the maximum penetration achievable by wind energy, I believe it is less than that, is it not about time that the whole wind program was abandoned. You are right in that the assumptions for the capacity credit is linear output over a wind farms life. If there is a technical problem somewhere down the line the capacity credit would be even worse. 1) There is no scientific way to measure the contribution of wind on the grid. 2)At the McGill Summer school, Eddie O'Connor of Mainstream Renewable Energy said the 37% wind target was unachievable, exactly what I have been saying. 3) No more than 50% of wind can be allowed into the grid at any one time. 4) Wind must be backed up by additional (extra) fast acting fossil fuel plant. 5) Wind cannot be used on its own as it is non-synchronised electrical energy. 6) Wind has no credit capacity of its own and cannot exist without massive subsidies. 7) Not one fossil fuel power station was ever shut down due to wind. 9) In calm cold conditions, wind turbines compete with homes for fuel generated grid power required for safety, information, ice prevention, heating and lighting. 10) The environmental damage caused is horrendous, it requires that the SEA Directive be by-passed, the Aarhus Convention be ignored and the concerns of local residents be ignored. 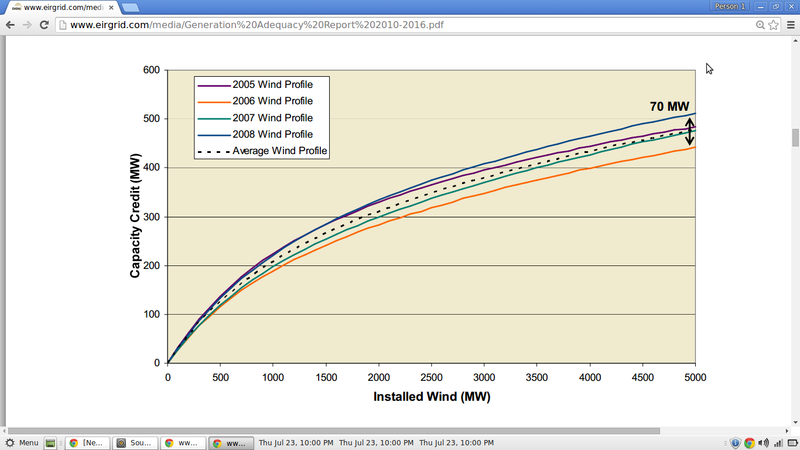 Capacity credit is a good scientific measure of the contribution of wind on the grid as I have shown. It is not linear but rather diminishes as you add more wind. There is a contribution but its small compared to a conventional plant. A biomass plant would have much higher. A little unambiguous honesty by the renewable energy sector might go some way to restore public confidence in the integrity of their claims. Unfortunately whilst the SSE Airtricity statement is technically correct, it does involve an element of “read my lips”. Airtricity was of course the creation of the redoubtable Dr. Eddie O’Connor, who assured the McGill Summer School this week that hundreds of businesses throughout Ireland had been saved from certain liquidation by the low-cost renewable energy provided by Airtricity under his tutelage. He went on to point out that as wind farm objectors are hysterical fools and that the DCENR is staffed by low-imagination time servers, the public would do far better to lend their support to his vision of a pan European electricity super grid fed by batteries of large wind farms over the length and breadth of Ireland. One gets the impression that Dr. O’Connor is more comfortable with Ayn Rand than with Hobbes, Locke and Rosseau. Whether his vision is to the long-term benefit of the Irish people remains to be seen. Eddie O'Connor has consistently shunned any debate with me and my campaigners. Two years ago the wind industry agreed to attend a community meeting in County Laois, but withdrew when they heard I would attend. There is no need to reiterate why wind energy is a much more expensive form of electrical energy than conventional forms. So why does he make such a statement that it is cheaper. It is not cheaper. In my videos https://www.youtube.com/watch?v=HvpVXH__rR8 or ---------valmartinireland yout tube--- part 2, I deal with that and parts of Eddie O'Connor's speech agrees with that. None of this is denied by Eirgrid. The idea that the problems can be solved by multi billion euros investment in concrete and steel to straddle Europe with pylons is "live horse and you will get grass". The electricity has to be generated somewhere, there are significant generation losses over distance and under sea cables have to be direct current with no sychronization. All no doubt to be built in defiance with the SEA directive, without public participation and without input from independent engineers. He clearly feels the EU will back him and that calls into question the democratic credentials of the EU. No one can show a saving of even one bags of coal equivalent from all the wind farms in Europe, Were it not for planning refusals, we would now be installing as much wind capacity as could be built. There would be high immigration to do the work, pension funds and public banks would be raided leaving nothing for us. The temporary employment created would be used to get votes in the next election and at the end of that, we would be back to square one with massive surplus generation and nothing to live on. Not only that, but we could not afford to pay for power and the value of all the infrastructure would be scrap metal. That would leave a huge hole in the banks where our money is stored and they could not pay it back our deposits. So the citizen is on the hook for the hardship. Greece was one of the first countries to try this. Thank god the British have seen the light. I agree with admin that credit capacity is the correct scientific way to measure all forms of generation. I meant that there is no official way accepted or agreed by governments to measure wind's contribution. Everyone accepts the way company finances are measured, how water pollution is measured, how metric to imperial conversions is measured, the butterfat content of milk. Is it not a little odd that there is no accepted way to measure the real contribution for wind energy? In this context measuring means comparing the quantity of other sources of mains electricity turned off or saved with the installed capacity of wind over one year as a percentage. Europe to enter period of electricity rationing ? Who was right - IWEA or IAE ?